Today on the ramp bridge of Lupu Bridge, I saw some towing Expo Buses were towed by towing truck. These Expo Buses use electricity and need to charge at bus stations from time to time in the expo site. That is the reason they can only be reliably moved by Bowing truck out the site. The once splendid Expo site is still splendid, but without any visitors in it. 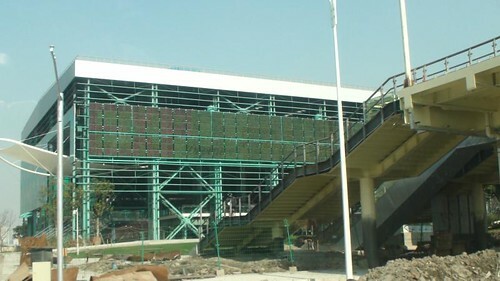 A pavilion on the Puxi side is surrounded by green construction nets. It seems the destruction is going to start soon. Bye Bye, Expo! Expo is over. We visited the site on October 30 for the last time. Wendy’s comment: “I started to regret that we hadn’t come more often”. She loves the Italian Pavilion in particular. What the expo left for the people in this country? 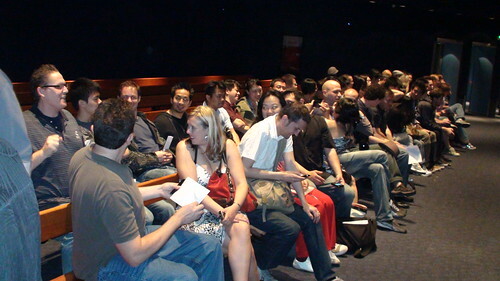 I would say: It is the biggest event to educate people to line up. 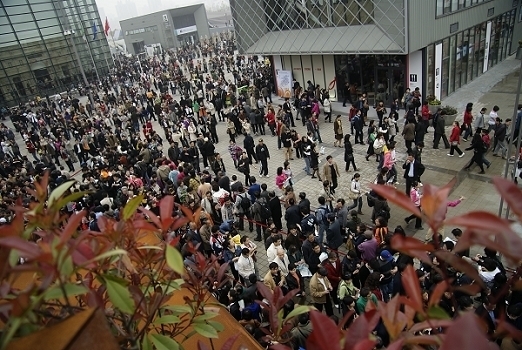 The long lines had became the symbolic sign for this expo. 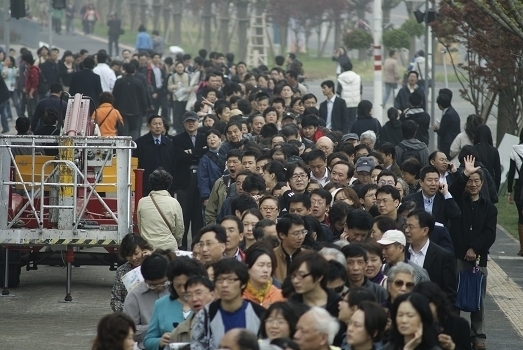 People waited for up to 12 hours to get to a pavilion. Think about it. How does lining-up for 70 million people impact the line-up habit for this country? If you haven’t visited expo yet, you only have five days left before the event concludes on October 31. The good news is, there are relatively much fewer people visiting expo in the last few days since Monday, when the ticket price raised by 40 RMB to prevent final rush. Wendy went there today and reported back via SMS that they didn’t need to line up for many pavilion (really hot pavilions like China pavilion excluded). That is consistent with the official number of visitor today: 390K (comparing with 1 million in peak time). The expo also successfully reached the goal of 70 million the other day (too accurately executed to believe). So, in Shanghai, not visited expo yet and don’t mind the extra 40 RMB? it is time to go. This is the third time I visit the Expo site. I don’t enjoy waiting in the long line for hours (up to 4 hours) under strong sun light, I choose some less popular pavilions to get start. My first visit happened to be Argentina Pavilion. It is pure artistic, and I have no problem with it. 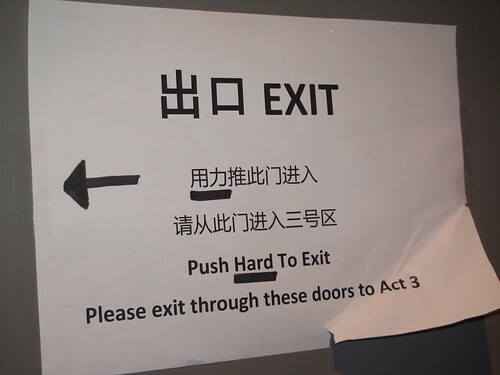 But that caused big problem to the audience. Obviously they didn’t expect how many children coming with their parents. The boy on the left side was forced to “sleep” on his mother’s lap, and the face of the girl three rows behind me was hidden behind big balloon by her mother. Other parents just brought their children strictly out of the theater. For the older people, it is even a big problem. Most of them are very unease – they are more confused than interested. You know, it is awkward situation in that pavilion. When the government takes care of its citizen too well, and protect all the adults as they were still 10 years old, film like this will never appear in this land, but Expo is a window for people to sniff the “outside” stuff. That is the key conflicts people encounter in many sites in expo. Well… There are many other pavilions, but I just felt this scene to be the most funny. 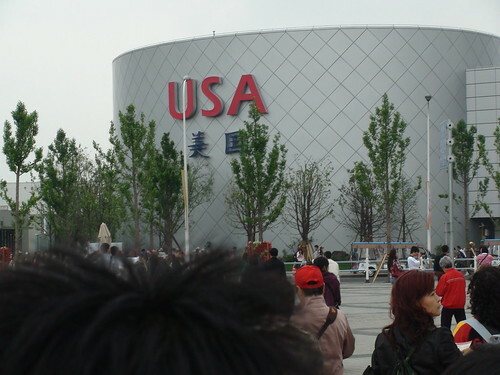 I was at the USA Pavilion at Shanghai Expo. Surprisingly, it is much better than a tent (as people joked about it when the funding problem was not solved). Pay attention to the “hard” word in the posting. Funny. A good way to cure a minor design mistake. 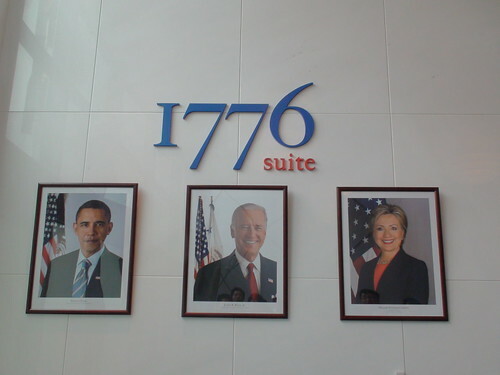 In a meeting this afternoon, heard someone from one Expo pavilion. They have one of the longest lines in the expo site. The interesting finding they have was, the long line has acted as a biased filter. Most of the visitors coming to the pavilion are either labor workers, or old people – people who are less sensitive in time. They also want to attract people with higher education, or at least between 20-40, but they are just big fans of waiting in the line for hours. The best way to get attention is to give attention. (MeiGuoGuan did, and I talked back). Twitter Blackbird Pie is nice – a simple to dead tool, but solve a big problem. Are people in twitter intentionally want to embarrass people in the Internet field by introducing really simple, but popular tools? SJTU = Shanghai Jiao Tong University. From May 1, the security level of SJTU has been raised to a level I had never saw, heard of, or even imagined in the last 15 years (since I first stepped in the campus in 1995). I saw the different today. 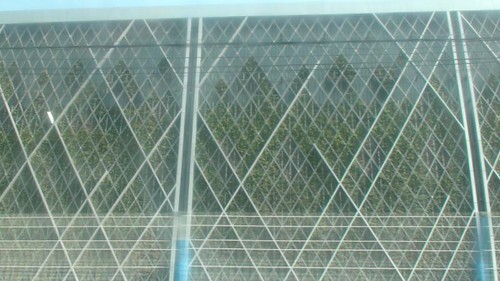 The campus was completely closed with the big automatic fence about the height of my shoulder closed all the time. 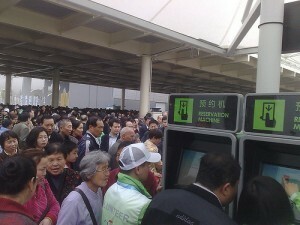 For cars, they will check the specially issued permit and an IC card before they open the gate. They have to make sure that your car is of resident on the campus. For people, they check carefully for student, faculty ID or other working permit one by one. They opened a very narrow entrance just allowing one person to pass, and there are many security guards jamming the entrance. For others who don’t have a campus car permit, or don’t have a student/faculty ID, sorry, no entrance. The problem for us now is, the package delivery people has to call the receiption from outside the campus (like UPS, Fedex, or EMS), and the person needs to go out of the campus himself to pick it. 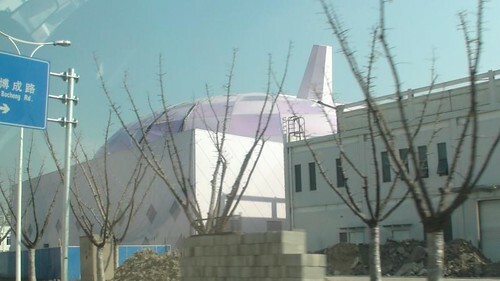 I have Expo ticket (normal days), and I am planning to visit it sometime in mid-May, so I can report what is going on inside the Expo site. Any of my readers have been there? How does it feel? The opening ceremony is exteremely disappointing. I didn’t have any exception for it, but I was still surprised. It is really boring. The fireworks is outside my window. The CCTV broadcast is on my TV. There IS several seconds of delay from what I see outside my window and what I see on TV. Expo is just 4 days away. Is it too late to ask this question? This year’s expo is special from most of the expo in the past. 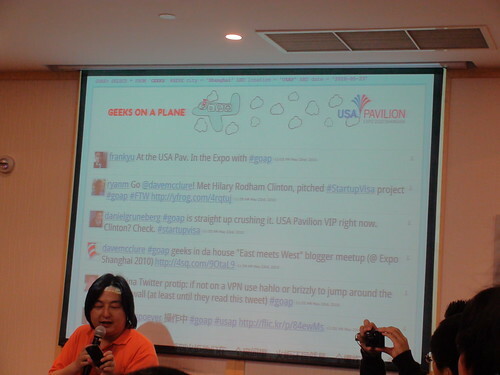 To be honest, I have never experienced previous Expo in other countries. I never heard about it before Shanghai started to bid for it. Now, it is regarded in all the media as an event as important as the Olympics. Is it true? I doubt it. I especially feel so when government officials pointed out again and again that “Olympics is not government hosted – it is just civil events, and Olympics is just 20 days – expo is half year….” It is pretty funny. There are many versions of the answer and for sure, it is not easy to get an answer when all the budget and detailed break down is kept as a secret. I can only list some of the “rumors” I heard. One version of the rumor is, the central government is paying for it. I don’t really believe in this version. The other version state that all the money comes from the Shanghai local government, and Expo bond, without any investment from the central government. This version seems more likely to me (baised as Shanghai resident). Disclaimer: without any solid evidence, I heard many people explain the reason Shanghai MUST get a big event like this: This is the only way Shanghai can keep its cost high, and thus keep more money locally instead of giving it to the central government. The current tax structure, Shanghai, as the economic powerhouse, and big manufacture center, Shanghai contribute a big portion of the total tax income (many sources say above 10%, but there is no way to verify this number). To get more money for the local construction, it is a good idea to take the chance to build metros (look at the 11 metro lines openned before expo), and airports (2 new terminals), and expressways (many of them). 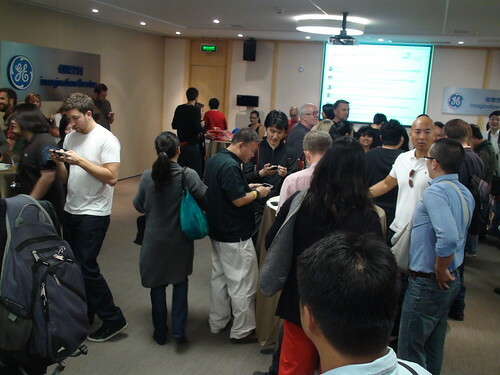 This way, when the cost is up, Shanghai has the bargain power to keep more locally for the benefit of the city. 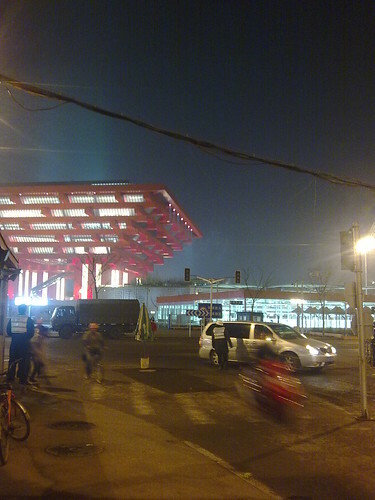 The expo was originally planned in the Huang Lou 黄楼 area (at the intersection of S20 and S1), near the Pudong airport – somewhere out of the outer ring. Later, the plan was modified to be the current downtown location. To make it happen, huge amount of money is needed to remove a steel plant, and a ship building plant. These heavy industry plants were called by some government officals as “the last scar on the face of Shanghai”. The idea is, for a moden city like Shanghai when the land price goes so high, it is not a good idea to have several big plants in the downtown. 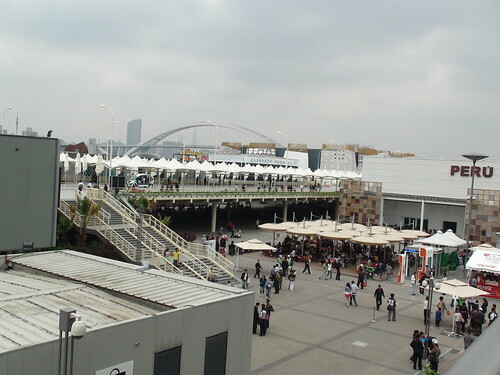 Expo is the perfect time to relocate them (with all the huge investment), get the land ready for construction, and build some temp pavilions on it. When the expo is over, that is a new area of Shanghai! 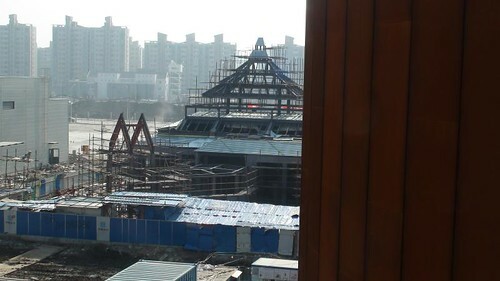 Although I started to concern about hosting expo based on the recent feedback of the 5 rehersal (people mountain people sea, and a little bit disappointing pavilions), there are some solid reasons why Shanghai wants and needs to build it. 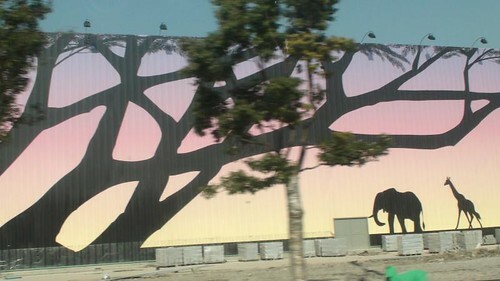 The Expo Preview happened on April 20, 2010, ten days before the grand opening. However, the feedback I got so far is very disappointing, almost scary. The feedback mostly concentrates on the fact that there are too many people. It takes about 1 hour to pass the security check, 2 hours to get anything to eat, 3 hours to get some serious food like Dumplin. For the China Pavilion? Most people can only see from the outside. Most of the comments I saw from my friends and people on twitter are – completely massy. Most of the news I saw on Shanghai TV, CCTV was, the first day was smooth and successful. The contrast is so big that I am not surprised. 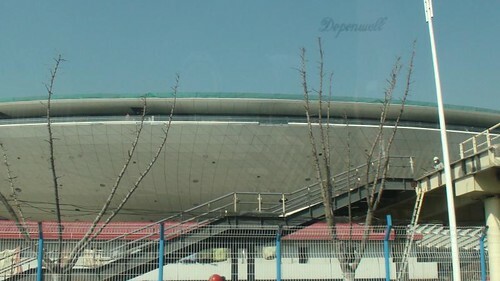 Here are some photos I saw on Kaixin001.com. I cannot verify the photographer of the pictures. Here are some of them. This is actually not very surprising to me. 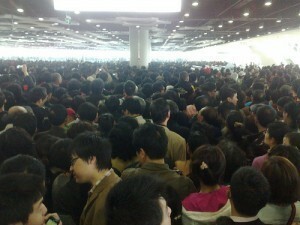 I started to worry about the Expo, and hope there will be no big accident related to the huge number of people. The people they handle on April 20 is just 2/5 of the actual expected volumn. What will happen then? The good traffic condition only lasted for few weeks, before it is getting worse. From the slow moving cars on the road, and policemen with flashing police car at every city corner, I got the signal – Expo is no longer a count down number. It is getting real. People get nervous. There are problems when there are visitor peak that the city cannot handle. 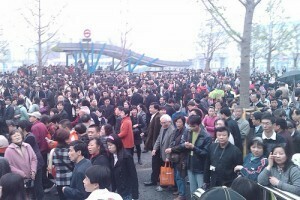 There are also problems, maybe a bigger one, that there are not as many people as expected to come. Businesses have learn a lesson from the over-promised-under-delivered business opportunity of Beijing Olympics. The hotel room price is still relatively stable. The party is almost there. What will happen? 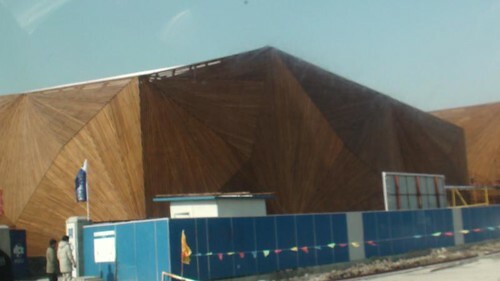 First hand photos of the Expo site. More Expo news is coming from this blog. 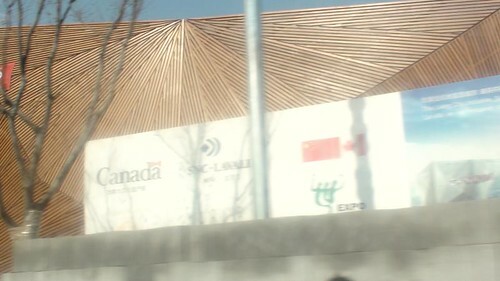 I am reporting 3 km away from the Shanghai 2010 Expo site. 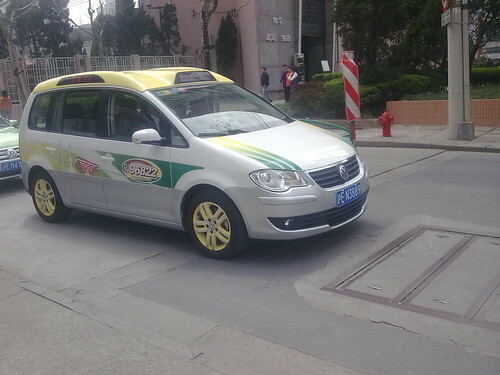 I am not a big fan of this idea – to manufacture 4000 special taxi just for the Expo. My proposed plan is to leverage the current taxi system, and expand it. If the standard is not good enough for the expo, why not take the opportunity increase the standard? However, when I see the taxi, I am still impressed. It looks nice. 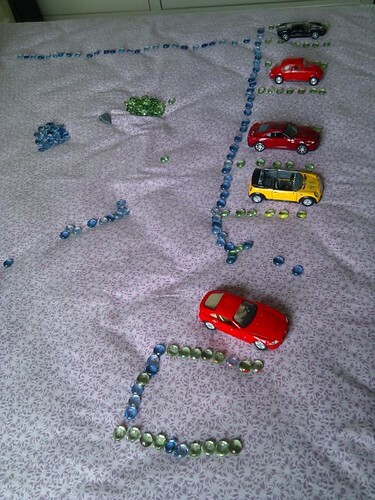 The 3600 Volkswagen Tourans look much better than I thought. Hmmm…. That is the good side of involving a big private company – Shanghai Volkswagen instead of everything done by the government (look at the advertisement for Expo in the Times Square in New York!) Good PR for VW. I was luck to catch one of the first 100 taxi this morning, but I am not luckier to get a full shot of it. 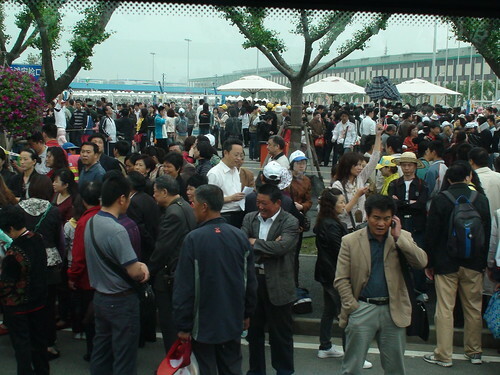 Since no public vehicles can enter the Expo site, including taxis, they issued license to these special taxis to enter the site. Question: will the 4000 taxi serve the 400K people per day? Let’s still bet public transportation like Metro, and bus. The Expo lighting work is finished. 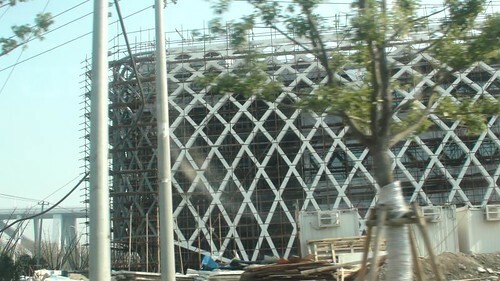 From the South Pudong Road, you will see part of the Expo site. With the laser lights with all colors shooting into the sky, Expo site at night is amazing. I asked “What is the meaning of an Expo?” With the lights, and the scene, I just fell an Expo is wonderful (if we put aside all the cost related to it aside for a moment). Although today is not a good day to announce anything formal, the party secretary of Shanghai (who ranks higher than mayor in the Chinese power hierarchy) announced today that every household in Shanghai will get a free expo ticket, and a public transportation card with 200 RMB in it to show the appreciation from the government for the support and understanding. That sounds good – a good and friendly move from the government. 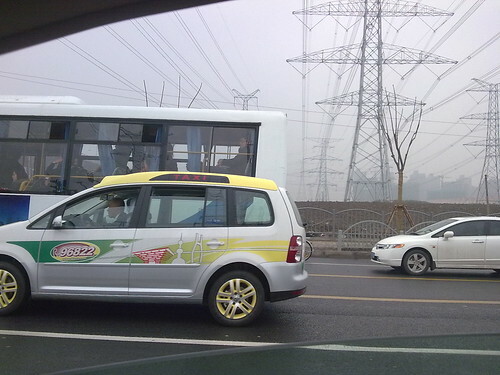 Saw another Expo taxi at Gongcheng Road near Jiaotong University. Expo is officially 31 days away. I saw the expo site from the Inner Ring Elevated Highway tonight. They are testing the Expo light effect today. At night, the site is so beautiful. From the gap of two buildings, I saw a pavilion with OIL logo on it. That redish shining pavilion is like a magic box. I didn’t get the chance to take a photo of it. 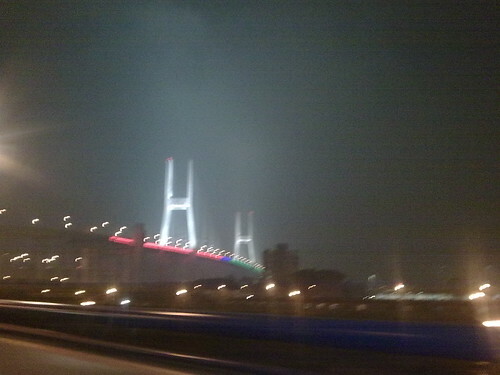 The Nanpu Bridge is lightened, with color bar on the side facing the Expo site. 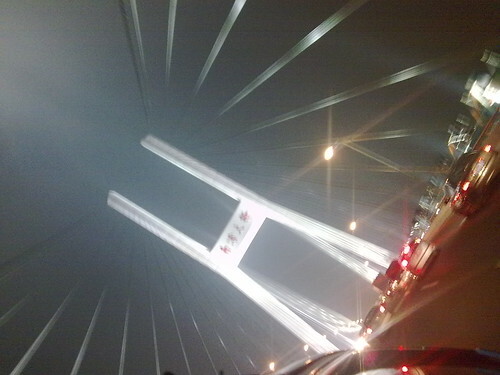 I do have some blurred picture for the decorated Nanpu bridge. It seems this part time Expo journalist need to get busy. From time to time, we need someone around you to get you excited, and you pass the passion on and on. Some times, it is yourself initiating that passion, some times inspired by others. But always, it is good to keep passion about what we are doing, and do our best to be best. The expo is coming. Everything is tighten up. 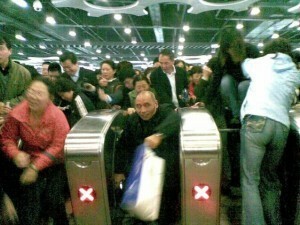 About few months ago, Shanghai started to check baggage at the entrance of major metro stations. The rule of whether a bag should be checked is not consistent. I am wearing my black back bag all the time I enter metro. Most of the time, the security just ignore me, and allow me to enter without scanning, just like they treat the small hand bags ladies carry. In other time, security asks me to put my bag into the scanning machine for security check. It is like this in most of the stations. The difference is, in bigger stations like Xujiahui, they tighten it, and in smaller stations like Jinxiu Road, they cover the big machines. Just two security guide using hand check. One part of travel is to see the other side of the world (like my recent two travels), and the other interesting part is to leave Shanghai for 10 days and get back to see how things change quickly. It is always good to get a reasonable distance from daily life, and when back, you discover more changes than you are always there. This time, the change is the roads. 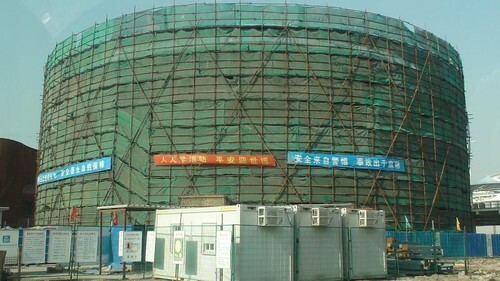 In preparation of Shanghai Expo 2010, which is just 2 months away, huge constructions spread out through out the city. That includes new elevated highways, improvement of current roads, and new metro stations. 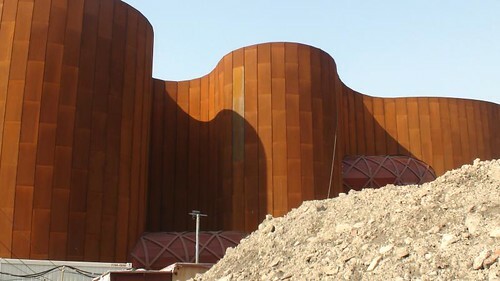 In early or March, many of the constructions are completed, and the scare of the city heals quickly, and perfectly. 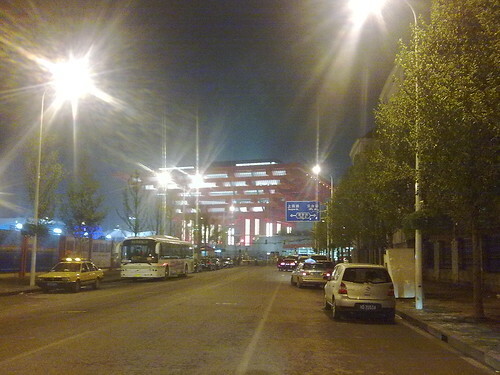 Zhaojiabang Road 肇嘉浜路 is one of the road that is impacted most. The 7 something new metro stations make it almost impossible to navigate, and delays directly caused our decision to move from Pudong to Puxi. I took a taxi yesterday. The same road is back to its original status, and even better. The road is newly paved, and the lanes were marked with freshly painted white lines. That kind of “brand new” feeling is so strong, that I just would love to drive my cars there. The metro station is finished leaving many exits with Metro signs. 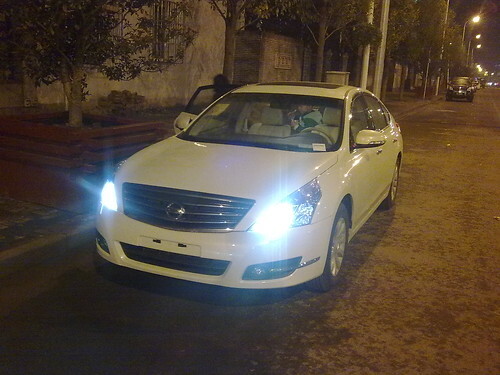 The other roads I paid particular attending includes the South Yanggao Road 杨高南路, and Longyang Road 龙阳路. The elevated highway and viaducts were completed, and the crowded roads suddenly become pretty empty with the new addition of the same size of capacity (but without red lights). Good. Good. Shanghai started to become charming again. 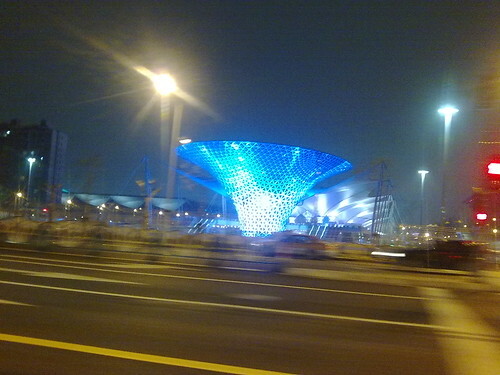 On December 19, 2009, Wendy and I visited the Shanghai Expo Site. 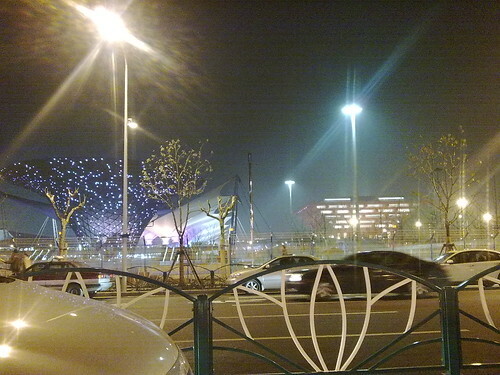 The last time I visited was back to May 11, 2009 (Second Impression of Shanghai Expo Site). This is the third impression of the site. To be short, my impression is, the Expo is getting real. 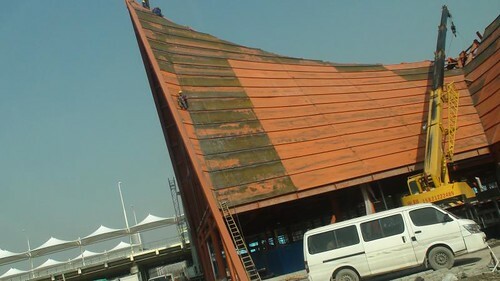 When you see the pavilions standing there, and people busy working on it, you know the expo is really not far away, although you always can easily understand conceptually, that it is just 130 days away. Here are the photos I took during the trip. 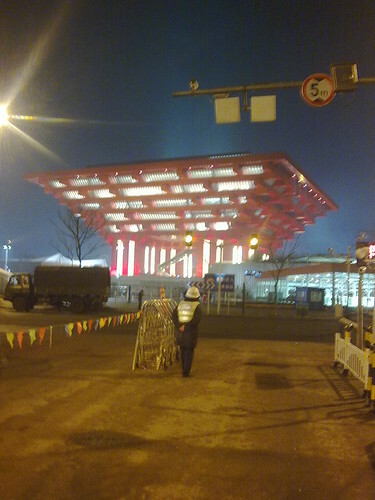 Hope it gives you a preview of what Shanghai Expo looks like in 2010. Hope to see you there. 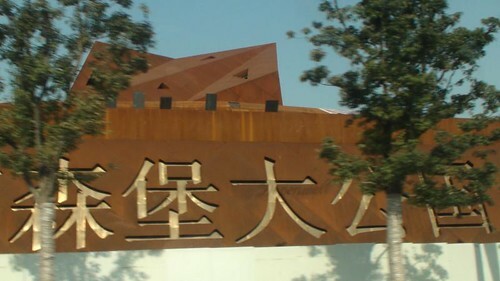 This is the landmark – China Pavilion. 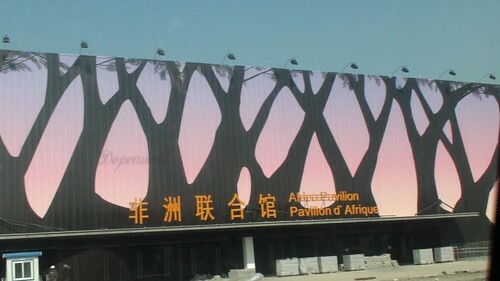 See more pictures in this article dedicated to this Pavilion. I will also have another dedicated article on this Pavilion. Thanks to the invitation and accompany of Peter, Sarah, and Lina to make my trip to Shanghai Expo Site the second time possible. 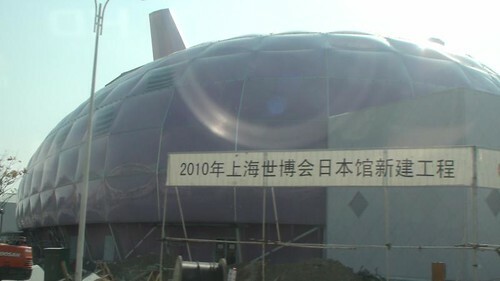 It was a great surprise to me that I found out the Japanese Pavilion of Shanghai Expo 2010 is actually purplish. I read a lot about the holes, and the “ears” of this living architect, but I remember it was always white in most publications. 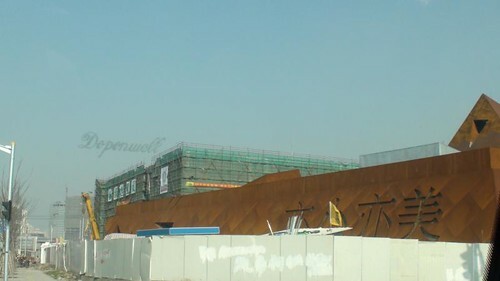 I was not able to take a full picture of this building – how can I for any of the pavilions under construction in the Shanghai Expo construction site. Here are some overview and preview of what the pavilion may look like in near future. 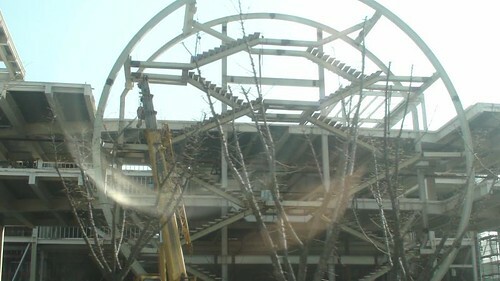 The photo was taken on December 19, 2009. It reminds me of the architect of Centre National d’art et de Culture Georges Pompidou. Very industrialized, and aggressive visual design. 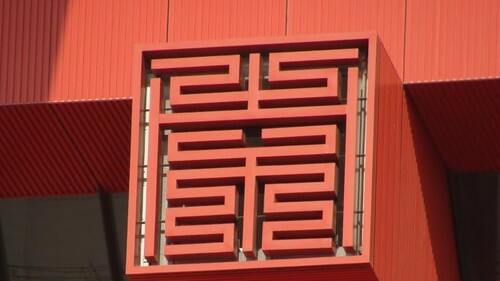 They put big character of the name of Luxenburg in Chinese, and “Small is Beautiful” on the surface of the building. 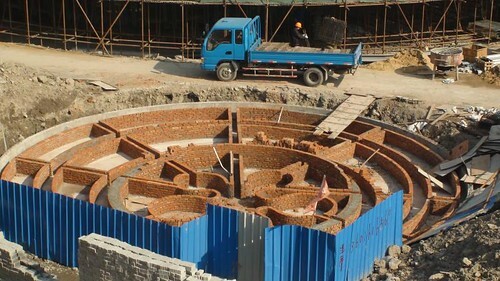 This is very impressive small architect. There will be daily performance there. The blocks reminds me of the French Pavilion, but it is smaller, less aggressive, and modest. I thought it is a maze, but it isn’t. 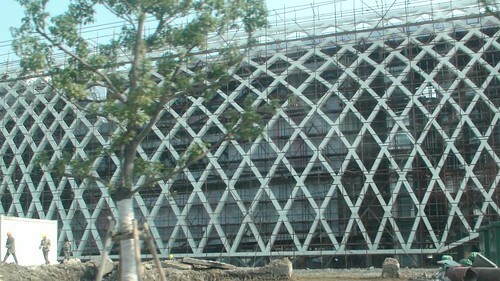 It is the base structure of a building. Amazing site! Looking forward to participating in the Expo the next year. 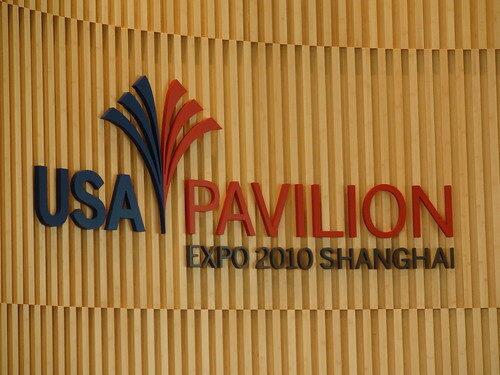 The Shanghai Expo is 130 days to come. Thanks to the invitation of Peter and Lina from Australian Pavilion, I had the chance to visit the Expo site way ahead of its opening. 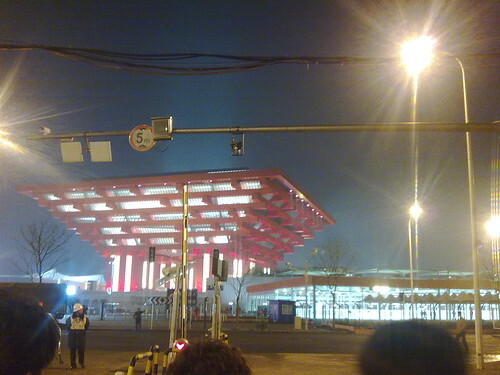 Here is the photo I took at the foot of the China Pavilion of Shanghai Expo 2010. 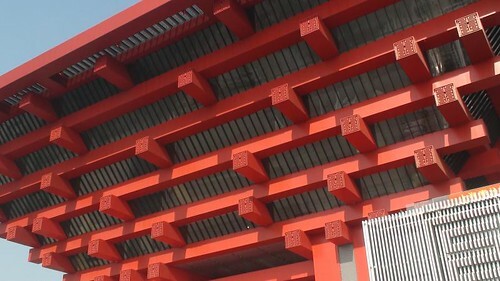 Above is the fresh red facade of the China Pavilion – the Oriental Crown. At the right lower corner is the surrounding buildings to the main architect. At the edge of each big pole of the Pavilion, there is pattern like this. I still didn’t find out the meaning of the design yet – it seems like a good word in Chinese. 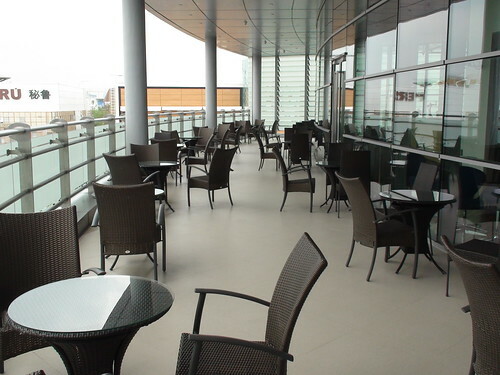 The corner of the big roof – the crown. 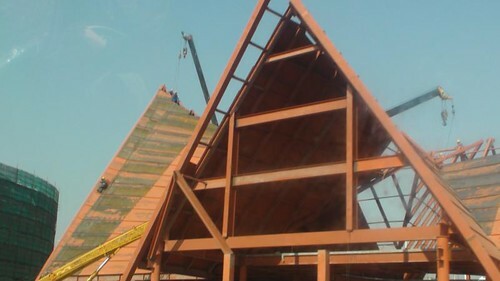 Below is the whole picture of the Pavilion. Sorry for the blurry image – I took it from behind the window of the car. 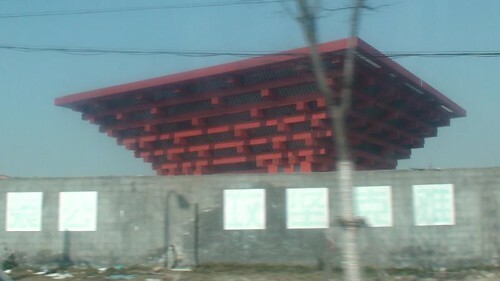 The pavilion is very nice – the red is better than saw on computer rendering image. 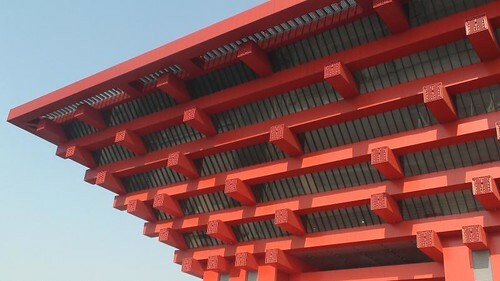 The “forbidden city red” (how they named it) looks very fresh under the sky. 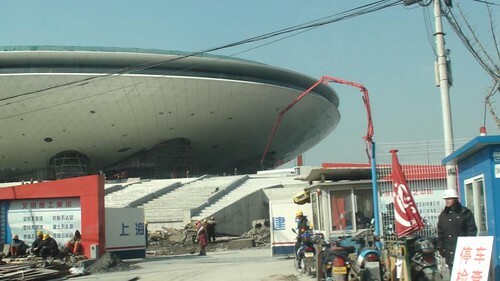 I am very excited to see the huge building. It is not that big if you stand before it – a very approachable architect. Looking forward to seeing you at the China Pavilion the next year!